Why a (World Climate) Simulation? Imagine a time in the future when the people from all nations of the world decide to address climate change. What is your vision of international success on addressing climate change? 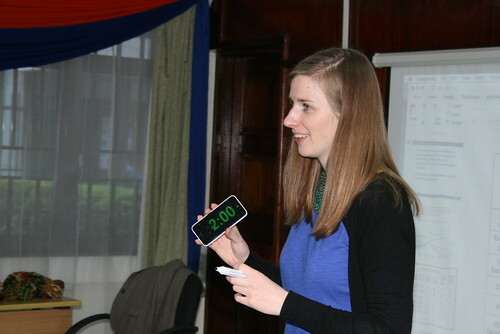 The World Climate Simulation helps participants to create a scenario that limits temperature increase to 2 degrees C by 2100 by changing five possible factors – the emissions peak year; the emissions reduction year; the reduction rate; a commitment to reducing deforestation; and a commitment to increasing afforestation. As the participants’ play UN climate negotiators and take up the positions of negotiators of different countries/negotiating blocs, they feel the full weight of delivering an ambitious global climate deal while considering economic impacts, international equity, viability, and other factors important to their nations. The impact of their decisions is demonstrated using C-ROADS, a computer model that enables participants to find out how their decisions impact the global climate system in real-time. How do I get the content materials for the World Climate Simulation? Start by reading the Facilitator’s Guide. It will give you step by step guidelines of how to run World Climate. Pay attention to any hyperlinks or additional materials mentioned in the Guide and familiarize yourself with them e.g. the slide sets, the briefing materials, and C-ROADS. Download C-ROADS and start practicing how to create different scenarios and how to explain to others what is happening on the model (Use the Guide which has tips on this). Our website has videos on how to use C-ROADS as well as a list of Frequently Asked Questions on C-ROADS. Check out the Slide Deck; these are the slides that you use as the facilitator of World Climate simulation. They provide a background of climate science and policy, and impacts of climate change. We regularly upload an updated version; feel free to ask us. Feel free to be creative and customize World Climate Simulation to suite your needs and the audience. Some facilitators have replaced some of the slides with slides of their country climate information, a video, or even a play on climate change. The Briefing materials describe the status of climate policy in each of the negotiating blocs. Familiarize yourself with them as you can brief your participants on each. Recorded Webinars: you can watch past webinars or register to join upcoming webinars which will prepare you for your World Climate Simulation. Evaluation surveys: Download here pre- and post-surveys that you give participants to fill in before and after the World Climate Simulation. This is part of a research effort of Climate Interactive and UMass to help us assess the impacts of World Climate Simulations on learning and behaviour change. Join our Online Google community and start asking any kind of questions that you may have as you organize your event. This way you will learn how others are conducting World Climate events across the world and share your experiences with them. World Climate Simulation event poster: with a pdf editor software, you can edit this flyer for your event communication and dissemination. World Climate Simulations are now accredited as UNFCCC COP 22 events, and therefore, once you have registered an event, do let us know and we shall send you the COP22 logo. Remember to share the poster with us so that we can publicize your event through our social media networks. Register your event. It helps us keep track of all registered events, and connect you with people in your region that might be of help in facilitating World Climate simulations. Connect with us on Facebook and Twitter and keep us updated with photos of your event, videos, and anecdotes from the participants. We also encourage you to write a blogpost to be featured on our website. How much does it cost to use World Climate simulation materials? FREE! Climate Interactive is happy to make the entire world Climate Materials Pack available for free to everyone around the world. Whether you’re a UN delegate, high school student, university professor, religious group, or business, all the materials required to host a successful experience are available at no charge on our website. We only ask that at a minimum you register your events with us. Is there a limitation to the number of participants? No. However, for a first event, we recommend you start with a small number of participants and then increase this as you gain confidence in facilitation. If you have a small group, you may use our 3-region version, which divides the participants into three groups. For this use C-Learn (only accessible online) or C-ROADS in 3-region mode. For larger groups, we recommend using the 6-region mode in C-ROADS and dividing your participants into 6 groups for an engaging and dynamic event. How do I report back after the event? Ask participants to fill out an evaluation before and after the event and send them into us, along with filling out the facilitators evaluation form. This helps our ongoing research on the learning impact of World Climate. Learn more here. Send us photos, blog posts and even videos taken during the event for us to learn what happened and to share with others to inspire them to run a World Climate Simulation. Feel free to communicate in any way appropriate to you. A blog post of your experiences is always a great report back to us. You can write up one and we shall help edit and publish on our blog. We can be reached at info@climateinteractive.org. Any suggestions on the sustainability and any other information I need to know? I would recommend you consider becoming an expert facilitator of World Climate Simulations. It is a platform for social and active learning. You can run it with different audiences and in different places. If you do so, you will receive updates from us on what is changing, and how best you can be part of the community as expert facilitators. You will also get connected to a global community of world climate facilitators and ambassadors. We are encouraging facilitators to also integrate World Climate Simulations in their capacity building and decision-making programmes at an organization level as it’s a very useful tool for communication and behavior change. Additionally, you can also train others to become facilitators. This will be important in increasing the capacity of many people on climate change and empowering them to take action. Our aim is to help people change their way of thinking and taking action on climate challenges, and move towards low-carbon development. By facilitating World Climate Simulations, you will be playing your role in inspiring action on low-carbon development.